Angelwax SHIELD SOFT TOP & FABRIC PROTECTOR is a state of the art fabric protection system which has been formulated to safeguard fabrics both inside and outside of your vehicle. 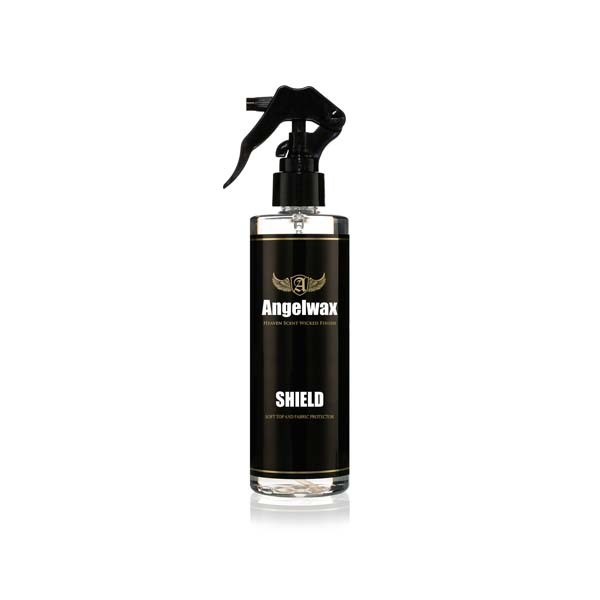 Angelwax SHIELD works as a stain repellent and is excellent on convertible hoods as well as fabric, carpets and any other material you choose to protect. Once treated with Angelwax SHIELD the surface will be protected and will repel stains effectively and ensure that the cleaning of the material is a lot easier. Available in 250ml and 5L bottles. Directions: For best results, thoroughly clean the interior fabric with Angelwax ABSOLUTION or Angelwax EXCELSIOR for convertible hoods and allow the surface to dry. Spray Angelwax SHIELD onto the area to be treated and allow the surface to dry for at least 12 hours. Top Tip: When cleaning heavily soiled fabrics & convertible soft tops, use a soft detailing brush to remove surface contaminants and clean thoroughly before applying Angelwax SHIELD.